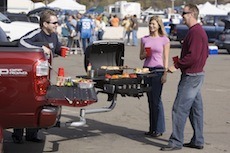 One way to offer low-key hospitality on a budget is to plan a tailgate party. Suitable for anything from a championship teen sporting event to a birthday party at the beach, hosting a tailgate party is big fun. Here are the basics you need to know in order to pull one off. Where you hold your tailgate party will determine a fair number of factors, including your menu, power supply and other things as well. For example, if you’re going on a multi-family camping excursion, you may find it best to have one person host an informal tailgate party as soon as you arrive, as people will feel hectic and hungry from setting up camp sites after a long drive to the destination. If it’s for a sporting event, then treats and snacks that celebrate the team’s colors might be a good fit, whereas beach parties cry out for kabobs and frozen cocktails. There are a variety of ways you can go here, but if you’re new to the tailgate party scene, then it’s best to keep things flexible. These tailgate menu ideas provide basic items that can easily be tweaked to accommodate carnivores, vegans and vegetarians alike. Also, depending on where you are holding your tailgate party, you may or may not have access to electricity and water. Of course, if your vehicle has an electrical outlet towards the back, then you can at least plug in a hot water dispenser or a crock pot without putting too much stress on the car battery. Otherwise, items that are easily cleaned up afterwards are the best to serve. Think chilled pressed sandwiches, macaroni salads, dairy-free dips and restaurant-strength tortilla chips. The supplies you’ll require will also vary according to your location and menu plan. If you’re going all out, then you may want to add aprons, tongs and portable heating options to your wish list of grilling gifts. At the very least, you’ll want to make sure you have a cooler stocked with ice, beverages and a few prepared foods along with a container of condiments and eco-friendly paper products. Doing as much in advance as you can frees you up to be available to your guests. After all, you want to enjoy the tailgating party too. Simple tips for beginners include cutting vegetables up ahead of time for dipping, threading mushroom kabobs for a fast grill-to-plate experience and mixing up some sangria to serve from an insulated drink dispenser. If it’s a celebratory event, then a cake or individually-decorated cupcakes may be in order. Throwing a tailgate party saves the overhead of an event venue, keeps things simple with basic eating implements (another cost saver), and maintains a casual atmosphere that your guests will appreciate. Try hosting one for your summer entertainment schedule and see how you like it! I love that idea! Another great one is to do a BBQ pot luck. Someone hosts the location, other people bring meats, and other sides and games. Cheap fun weekend plan.